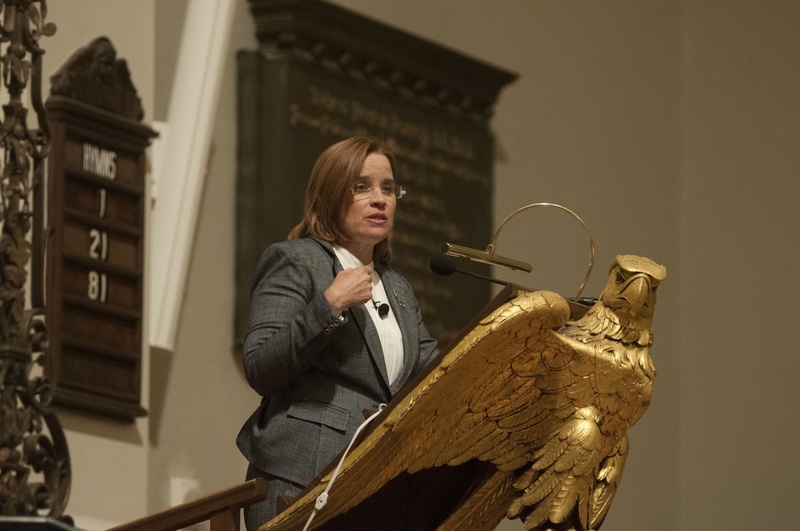 Carmen Yulín Cruz , mayor of San Juan, Puerto Rico, was honored as the Phillips Brooks House Association’s 12th Annual Robert Coles “Call of Service” Lecturer & Awardee at Memorial Church Friday evening. Cruz, who garnered national attention for her criticisms of the Trump administration's response to Hurricane Maria in 2017, is the first Latina woman to receive this public service honor. In her lecture, Cruz described the hurricane’s devastation, condemned the federal government’s “neglect” of the island, and urged the audience to “tell the inconvenient truth” and serve those who are suffering during humanitarian crises. During the program, Mayor of Cambridge Marc C. McGovern presented Cruz with a key to the City of Cambridge. His introduced his fellow mayor, citing her advocacy for marginalized groups including the BGLTQ and deaf communities. The festivities also included a bomba and spoken poetry performance celebrating Puerto Rican culture, and a special guest: Robert Coles ’50, a professor emeritus, author, and psychiatrist for whom the event is named, was in attendance and received a standing ovation. After the event, Cruz said she remained optimistic for a more compassionate approach to policy-making. After audience member Adebola S. Yakubu-Owolewa ’05 asked Cruz if she had considered running for the presidency in 2020, Cruz explained that her birth in a U.S. territory disqualified her from seeking that office. Even if she could, Cruz said, the job would not interest her. Yakubu-Owolewa said that she felt Cruz’s work with marginalized communities would have made her a strong candidate. “In the U.S., or anywhere, you only are going to treat people as well as you treat the most marginalized and vulnerable people. She has seen that in Puerto Rico, and she has fought tirelessly,” Yakubu-Owolewa said. The “Call of Service” Lecture & Award kicked off PBHA’s annual alumni weekend, which also honored the Harvard Square Homeless Shelter Corporation, Massachusetts Representative Byron D. Rushing ’64, and poet José G. Olivarez ’10. Michael C. A. Leonard ’17, nonprofit management fellow and project manager of the lecture and award, said that the decision to honor Cruz was confirmed this August. Cruz said that she hopes to continue collaboration and contact with PBHA. —Staff writer Liana E. Chow can be reached at liana.chow@thecrimson.com.